Climb On! Balm is the original rock climbing skin repair balm designed to soothe and repair abrasions, flappers, and all manner of skin damage. Featuring a 100% natural, chemical free, food grade recipe which has been specifically formulated into two blends: a bar and cream. Climb On! can soothe and repair abrasions, flappers, cuts, scrapes, grit rash, cracked cuticles and heels, burns... and basically any other skin damage which requires deep moisturising and nourishment. 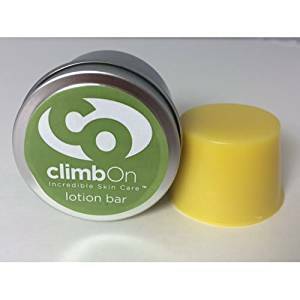 Specifically formulated for rock climbing and bouldering, Climb On! is a beeswax based product packed with essential oils, herbs and natural remedies. Acting as a humectant, it draws moisture to the skin and creates a natural water resistant barrier, to help skin stay protected. As you might imagine, the cream formula has a softer consistency and does seem to absorb a little quicker than the more solid soap-like bar formula, which can be better for travelling or when a more targeted/minor application is required. Due to its harder consistency, the bar formula does also seem to last a little longer. Both formulas incorporate the same basic ingredients and it is generally a matter of personal preference to whether you espouse the bar or the cream.